Three cheers for Joe Queenan. First, no booing high school teams. Then no booing the Fighting Irish. Before you know it, Mets fans will be getting ejected from their own stadium for booing the Yankees. And if Mets fans can't boo the despicable Yankees, why go on living? Update: Twiffer asks, rhetorically, who would want to make A-Rod cry? In my experience, more likely Yankees than Mets fans. 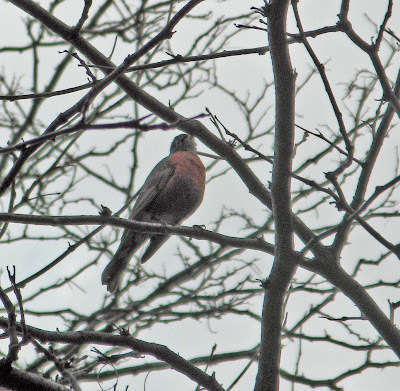 A few days before tonight's equinox, I saw this fellow above my path through the small wooded area adjoining the South Cove at Battery Park City. This image, taken from Astronomy Picture of the Day, is of a nearby (only 60 million or so light years) group of galaxies called Hickson 44, in the direction of the constellation Leo. 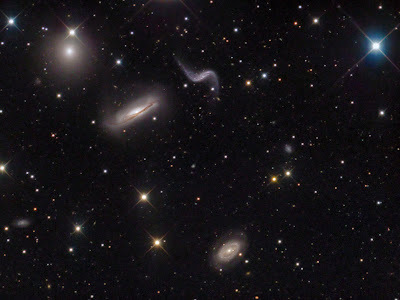 There are four galaxies in the picture. Three of them lie roughly in a row extending diagonally from just to the right of the bottom center to the upper left. The lower two of these are spiral galaxies similar to our own; the other, which looks like a slightly misty bright star, is an elliptical galaxy (the bright, bluish object at the upper right is a star in our galaxy). What I find fascinating is the galaxy that is just above and to the right of the largest spiral galaxy. It looks like it's doing a backflip in space. Perhaps this contortion is caused by the gravity of the other, nearby galaxies. There's an interesting parallel between this post on blogging and marketing by Kathy Sierra (found through a link posted by bEnder on WikiFray) and this New York Times column on baseball by David Brooks (linked to helpfully by sydbristow on Iraqwarit). You must be willing and able to turn off (temporarily) The Voice inside that says, "We'll never get away with this. People will hate it." ... [T]his is somewhat like The Inner Game approach or Drawing on the Right Side of the Brain or any of the other approaches to creativity that get your logical "talking" mind out of the way so all the more useful but non-speaking parts of your brain can get on with the important things you're trying to accomplish. [B]aseball has accomplished [an] ... important feat. It has developed a series of habits and standards of behavior to keep the conscious mind from interfering with the automatic mind. So, I suppose I need to approach each post with the same insouciance with which Jose Reyes regards a split-finger fastball or a Baltimore chop. But, perhaps more importantly, a la Sierra, I need to find a way to make you hate me.